Map showing the extent of the regional geologic spatial database (solid line) and the Northern Rocky Mountains physiographic province (dashed line) on a hillshaded image of a digital elevation model symbolized by elevation. (from figure 3). 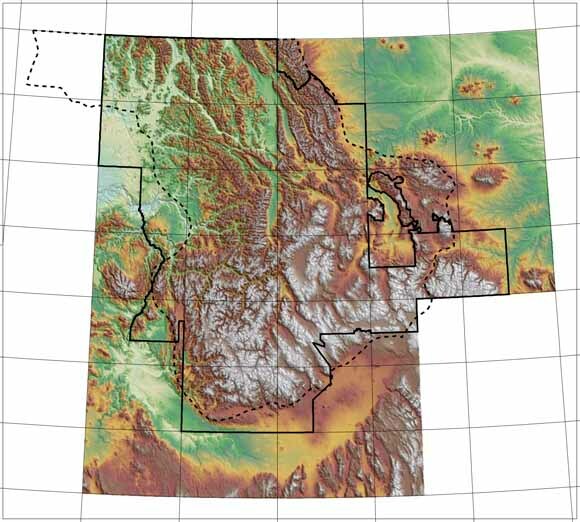 A regionally consistent and integrated geologic spatial database for the Northern Rocky Mountains of Montana, Idaho, and eastern Washington, brings together forty-three 1:100,000- to 1:250,000-scale digital geologic maps into a common database format. The regional geologic database is an ArcInfo coverage (NR_GEO) that contains spatial data for both lines (contacts, faults, fold axes, dikes, sills, veins, garnet isograd, boundaries) and polygons (geologic units). The database represents the original content of the published maps and provides easily used and consistent attribute content. We have also added information based on our interpretations of published reports. In particular, we have added attribute information that 1) classifies igneous rocks by age, composition, and name, and 2) allows the creation of derivative maps based on lithology. Three schemes are used to classify polygons and lines in this spatial database. The first scheme is based on the original map units defined in the source maps used to compile this database. The second approach uses the age, composition, and mode of occurrence to define igneous map units. The last approach uses the names of igneous intrusions and volcanic units to define map units. This database can be queried to address an assortment of geological questions and to produce a variety of derivative geological maps. Digital themes derived from these digital spatial geologic databases will be used by the U.S. Department of Agriculture Forest Service (USFS) for planning and research purposes and by the U.S. Geological Survey (USGS) to facilitate research and conduct mineral-resource assessments. Download a copy of the latest version of Acrobat Reader for free.